A half-scale remote-control airplane collided with a real aircraft over a Colorado airport last weekend. 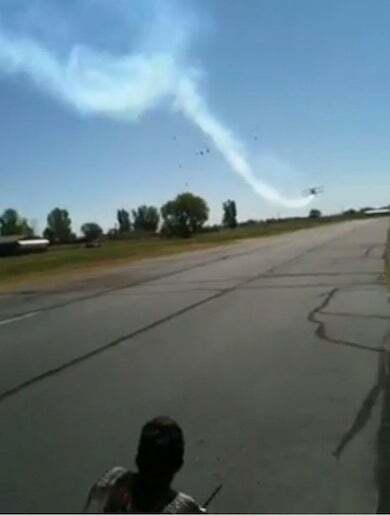 While there were no injuries, the incident exposed the growing tension between pilots and model aircraft enthusiasts and their ever-larger RC aircraft. Blame for the incident hasn't been officially set, but there's an ongoing FAA investigation and an initial report about the collision with the plane, which was a two-passenger, single-engine Acroduster biplane according to the FAA. "The event last Saturday took place at a private airfield. At a minimum they could have filed a NOTAM (Notice to Airman) alerting pilots of radio controlled operations at the airport during specific times, and if they were to allow those operations on or near the runway, the runway could have been closed," said FAA spokesman Allen Kenitzer. "In all cases with regard to radio controlled aircraft interfacing with manned vehicles, the manned vehicle retains the right of way." Even if the pilot of the RC aircraft was at fault, there's actually no law regarding the operation of remote-control aircraft near airports, or anywhere, despite the growing popularity of giant-scale aircraft as large as eight feet in size. The Academy of Model Aeronautics (AMA) does have a "Safety Code" stipulating modelers shouldn't fly above 400 feet within 3 miles of an airport and to notify airports when they're in close proximity, but Kenitzer says "It should be noted that the code is suggestive and not binding by federal law." The FAA also issued an advisory circular, but it was from 1981 and the hobby has evolved significantly in the last 29 years. The AMA, FAA, and other groups put together a list of suggestions (PDF) in 2009 for how to regulate these aircraft, but it has met with resistance from some hobbyists, and the report itself includes objections from the AMA. In addition to the debate over the creation of statutes related to hobby aircraft, this event exposed friction between model aircraft pilots and full-scale pilots. The forum where the model pilot posted in included numerous criticisms of the full-scale pilot. And, conversely, there are critiques of the RC pilot at pilot forums like Jetcareers. Mostly, posters on both sides put the blame on the people who organized the event and let full-scale aircraft, RC aircraft, and spectators mingle in close proximity. While many have taken a reasoned approach to discussing the incident, a member at the Flying Giants who goes by Craven posted a thread this video mocking the event. Poster Salmon, who claims he's a former member of the U.S. Air Force, questions not only the appropriateness of this jest, but also if the FAA might put into law the regulations currently under discussion. The FAA only needs one excuse to put a huge hammer on private flying of rc aircraft. Let's not fuel that fire. My suggestion is to remove this or put down in a humor thread someplace. I'm sure the proper investigations are taking place as we speak. We should all count our blessings for what we have and the fact no one was killed in that mishap. Remote control airplanes are fascinating, but this incident highlights the lack of regulation and the conflict that arises from the mixing of full-scale and scale aircraft.